A witness has described watching a "ferocious" blaze which destroyed about 1,400 cars break out in front of her. It engulfed the multi-storey car park in King's Dock - next to the Liverpool Echo Arena - on New Year's Eve. The venue was forced to cancel the Liverpool International Horse Show and hundreds were left stranded overnight. No casualties were reported. The fire chief said a sprinkler system could have stopped the fire, which began accidentally, from spreading. Sue Wright had been attending the horse show with her husband, former England footballer Mark Wright. She said she saw an old Land Rover - thought by firefighters to be the source of the blaze - with its engine on fire. "The flames were just shooting out of the engine and coming past the tyres," she said. "It looked like a ball of fire on the front of the car and it was producing a lot of smoke. "We just left everything in the car - handbags, telephone, cash - and just went. "I saw one car on fire but it was clear it was ferocious and spreading." Dan Stephens, of Merseyside Fire and Rescue, said the flames spread very quickly. "I believe a sprinkler system would certainly have suppressed the fire," he said. "It would definitely have limited the spread and given us a much better opportunity to put the fire out before it spread to the extent it did." 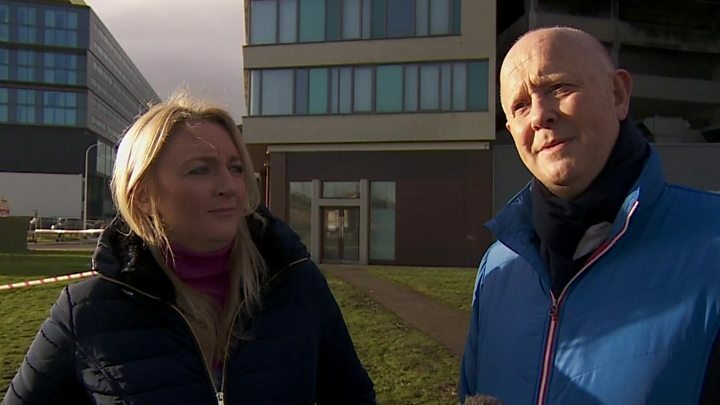 Image caption Sue Wright said her family's minibus was a "write-off"
Liverpool mayor Joe Anderson said there were lessons to be learned. "If there's things we can do to make the car parks more safer then that is exactly what we will do," he said. Liverpool City Council opened a reception centre at Lifestyles Gym for those unable to get home or needing temporary shelter. Others were offered accommodation or lifts by fellow show-goers or locals. Jan Clarke, from Adelaide in Australia, spent the night in the centre with daughters Kaitlyn Bolton, 27, and Shelly, 22 after they were evacuated from a block of flats near the arena. She said the first sign of the fire was smoke and the sound of explosions from across the dock. "We thought it was firecrackers," she said. The family took shelter at a nearby McDonald's, where they watched the fire develop. "All we could see was the smoke," Ms Clarke said. "We could see the smoke getting darker and darker and we heard multiple explosions." Ms Clarke, who celebrates her 60th birthday on Tuesday, praised the help and advice they were given by emergency services and was hopeful of a return to the flat. She said Shelly, who suffers from epilepsy, had left her medication behind and had missed two doses. "Everyone here was fabulous, I couldn't fault them," she added. Sean and Alison Lightning, from Northwood, near Shropshire, were walking towards the arena to see the show when they detected the smell of "burning plastic" in the air. "It was surreal," he said. "I said 'knowing our luck it'll be the venue' and it was." The couple had left their phones inside Mr Lightning's Nissan pick-up truck, but were helped to contact family by strangers and found temporary accommodation. "People in the street were helping us, ringing our family and leaving messages," he added. No animals were hurt in the blaze and four dogs were rescued from a car on the top floor of the car park earlier. Daniel Delsart, a French show jumper, was supposed to be competing in the show on Sunday evening but ended up helping to evacuate some of the horses. He said: "I rushed in with a few other riders and officials to pull out the last few horses in the multi-storey. "The smoke was getting worse and worse and the horses were pretty alarmed with all the fire engine sirens and bangs from cars exploding." Later smoke began to engulf the stables and he helped to move the horses again as it was getting difficult to breathe. "The scale of the fire, it was crazy. It's like something that you see on TV but you never think it's possible." Image caption The flames spread "very quickly"
The fire service was first called at about 16:40 GMT on New Year's Eve. Crews remain at the scene to continue investigations into the cause of the fire and are guarding against the risk of the building collapsing. 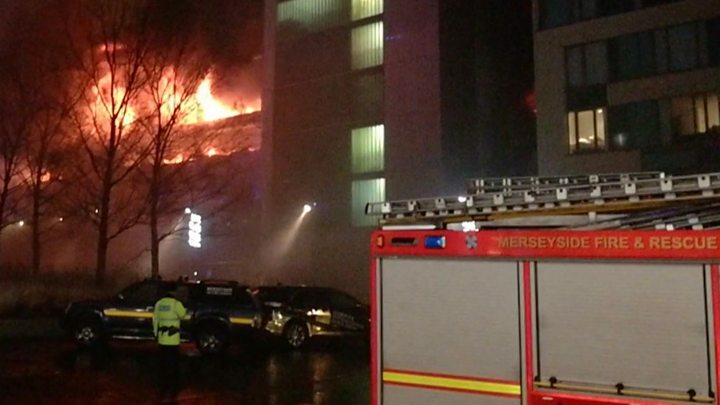 All vehicles in the 1,600-capacity car park were destroyed, Merseyside Police said. Those with vehicles in the car park have been told to contact their insurance company quoting reference number 650 of 31 December. A spokeswoman for the Echo Arena said the horse show was cancelled and that "all people and horses are safe and secure". The four-day event was due to finish with Sunday evening's show, where around 4,000 people were expected.